Root Canals- What is the Controversy? Are Root Canals A Healthy Option? This is a frequently asked question. The answer is not the same for every person, this is due to our immune systems. There are a few things we can know for certain if you are faced with making this personal decision. Our immune system has many tasks. The more our body is coping with, the less it is able to tolerate new infections/toxins. A person that is very healthy may have multiple Root Canals that never give them a problem. An immunocompromised person may find the Root Canal does not treat the tooth adequately. The tooth may become reinfected in a shorter period of time. Root Canals are not a lifetime treatment. They typically need to be retreated in 15-17 years, under normal circumstances. With the use of xrays we can monitor whether the tooth is healing. Many times an abscessed tooth has a dark spot on the xray that verifies bone is being resorbed by the infected tooth. Xrays typically also show a large cavity or broken tooth that allowed bacteria into the center of the tooth. When a tooth has been treated with a Root Canal, the resorbed bone begins forming around the treated roots again. This can be seen on an xray within 3-6 months after the Root Canal has been completed. If the bone doesn’t reform, this can indicate an incompletely treated tooth or impaired immune system. A tooth treated with a Root Canal releases drastically less toxins and bacteria than an untreated, abscessed tooth. If you have an abscessed tooth, the infection can spread all over your body-including your heart and brain. The treatment options for an abscessed tooth are extraction or Root Canal Therapy. The sooner the treatment, the better- whether you are immunocompromised or in full health. Not all teeth are good candidates for Root Canals, and many times removal is the only option. It is usually best to replace the tooth if you have it removed. Teeth near the missing tooth will shift, and the support of you face/teeth can collapse. Teeth can be replaced with a removable denture, bridge, or implant. 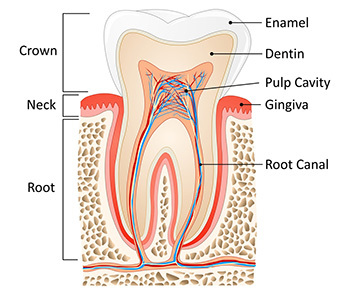 If you have a Root Canal, the tooth will usually need a filling to seal and protect the treatment. It may also require shaping of the damaged tooth to provide a proper anchor for a new crown. Most teeth treated with Root Canals will need a crown in addition to the core filling. Many holistic dentists recommend that all teeth with Root Canals be removed. Most also feel that an abscessed tooth should always be removed, rather than treated with Root Canal Therapy. All other points discussed previously in this article should be considered and you should consult with your physician (general or integrative) prior to making this decision.